During the latter half of the 9th century A.D. and the beginning of the 10th, there lived in the town of Śrīraṅgam, near Trichinopoly, a learned Vaiṣṇavite scholar named Raṅganāthāchārya, more usually called Nāthamuni, or the sage Nātha. 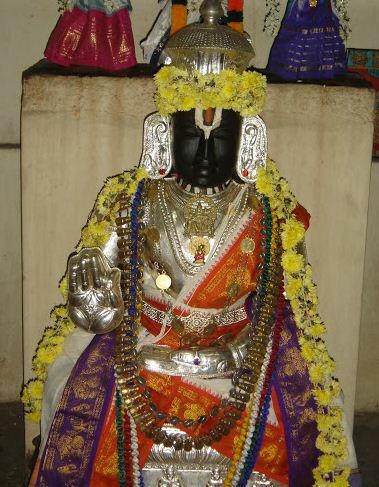 He is credited, in popular Tradition, with having reached the fabulous age of over 500 years and to have closed his career at about 920 A. D.
He was a native of Viranarayanapura, the modern Mannargudi of the Chidambaram Taluk, in the dominions of the Chola rulers of the day, who had not yet risen to the greatness which preceded their final decline in the end of the 13th century. He was probably a descendant of early Vaishnava immigrants, from the banks of the Jumna and other parts of the north, who carried the Bhāgavata or the Pāñcharātra cult to the south and laid the foundation for the spread of Vaishnavism during the second to the seventh centuries of modern era which were the best days of the Pallava rule. The period just mentioned was the period of the Vaiṣṇavite Āḻvārs, of whom the most revered is Caṭakōpaṉ or Nammāḷvār and the last is Tirumaṅgai Āḻvār. The latter was a contemporary of Tirugnana Sambandhar, the Śaiva saint, and of the Pallava ruler Narasimha-varman I. of Kāñchī (A. D. 625—645). The earlier Āḻvār must have lived long before this period, possibly in the opening years of the Christian era. He was a native of the city of Kurukai, now Āḻvār-Tirunagari, near Tinnevelly, on the Tāmraparṇī, in the kingdom of the Pāndyas, and composed over a thousand stanzas in classical Tamil. The literature of the Āḻvārs presupposes a thorough knowledge of the Krishna stories and the stories of the earlier avatars of Vishnu, and the frequent impassioned preferences to such stories, even in the songs of the earliest of the Āḻvārs, show that the South must have been flooded with these marvellous legends at a very early period. The story goes that Nāthamuni while at the Vishnu temple of Mannargudi (Chidambaram Taluk), his native place, heard some Brahmins from the southern end of the Peninsula recite Tamil verses of Caṭakōpaṉ addressed to the Vishnu God of Kumbhakonam and was charmed with their sense and diction. Nāthamuni thus started his research and seems to have finally recovered the whole of Caṭakōpaṉ’s works, and he then arranged them and the extant works of other Āḻvārs into four collections of about a thousand stanzas each. He is also said to have brought about the system of regular recitation of these texts during the festivals of the God at Śrīraṅgam and the system is practiced even to this day in most ancient temples dedicated to Vishnu. Nāthamuni was, we may assume, well-versed in the Sanskrit literature of his times and is said to have been an adept in yoga and to have been the last to practise it in this part of India. He is said to have composed a work called Nyāya tattva, and a work on yoga philosophy, ‘The Yoga Rāhasya’. The Neither of the works seems to be extant now, but extracts from the former are given in the Nyayasidhanjana, a work of Veṅkaṭa Nātha, or the famous Vedanta Deśika, a voluminous Vaishnava writer in Sanskrit and Tamil (A.D. 1269 - 1370), contemporary with the equally famous Vidyaranya, the Vijayanagar minister. The Nyāya tattva seems to have been an elaborate treatise covering the whole field of philosophy from the point of view of the Rāmānuja school and was developed further by later writers of the same school. Though possibly a good Tamil scholar, Nāthamuni has left no Tamil work of his own behind, except a few memorial verses prefixed to the works of three of the Āḻvārs, namely, Nammāḷvār, Viṣṇucitta and Māthurā Kavi. Certain similar Sanskrit verses prefixed to the works of Nammāḷvār are also ascribed to him. The ritual of worship as observed in Vishnu temples is based on two early standard works. One of them is known as the Vaikhānasa Gotra, probably belonging to the black Yajur-Veda school. The other work is the Pāñcharātra Āgama belonging to the extensive Tantra literature, popularly believed to have been composed by God Nārāyaṇa Himself. In addition to laying down the modes of Worship both in temples and at houses, the Āgama contains rules of conduct for the Vaiṣṇavites and has a peculiar philosophy of its own, namely, that of the Bhāgavata tradition. The system is, of course, of very ancient date and is referred in the Mahābhārata; and the Bādarāyaṇa sūtras on Uttara Mimāṁsa are understood to refer to this philosophy in the four sutras that conclude Pāda II of the 2nd Adhyāya. Nāthamuni’s contribution to the ritual was the provision for the recitation of the Tamil Vedas, as the works of the Āḻvārs came to be collectively called, on appropriate occasions during the main festivals of the God. The immediate effect of such an arrangement was the critical study of the Tiruvāymoḷi as Caṭakōpaṉ’s work is usually called; and, from this time forward, a school of combined Sanskrit and Tamil scholarship arose, which developed into great importance in later days and finally divided the Vaishnava sect into the two forms of the Northern and the Southern or the Vaḍakalai and the Teṅkalai sections. The first commentary on the work of Caṭakōpaṉ was, however, written only in the twelfth century towards the close of Rāmānuja’s life by a pupil of his. We have no means of ascertaining whether Nāthamuni was a complete follower of all the doctrines that now go by the name of the Rāmānuja school, but as he is traditionally considered the founder of that school, it is to be presumed that he was. We shall see further on that his grandson, Yamunacharya has really laid the foundation for all the doctrines that now go under Rāmānuja’s name. The doctrine peculiar to the Rāmānuja school and considerably elaborated by the religious teachers who succeeded him to the doctrine of Prapatti or surrender to God in absolute renunciation and faith. It is practically founded on the Pāñcharātra Tantra referred to already and is cardinal doctrine of the Vaiṣṇavite in his practical religion. It is, however, said to have been accepted and brought into practice by the sage Caṭakōpaṉ himself and by Nāthamuni after him. The details of the doctrine are a fruitful source of controversy among the followers of Rāmānuja and a very respectable amount of literature is even now extant on the subject. Readers of the Rāmāyaṇa will remember how that great work is said to have been published for the first time by being sung in the court of Rāma himself by two musical pupils of Vālmīki, the author, who afterwards turned out to be Rāma’s sons. The Tamil songs of Caṭakōpaṉ are similarly sung to this day at Śrīraṅgam and other places and Nāthamuni is said to have set them to music soon after his discovery of the work. The music was however, of a celestial kind not easily appreciable by ordinary folk. It is said that a dancing girl of the time sang songs in the celestial tune in the court of the Chola king of the day whose capital was Gangaikonda Cholapuram, in the Trichinopoly District, not far from the birthplace of Nāthamuni. The king is said to have slighted the musician as he could not appreciate the celestial note and to have preferred another singer who sang the usual tunes. The former dancing girl soon after reached Viranarayanapura and sang before the god of that place and was warmly appreciated by Nāthamuni as the music was after his own heart. The Chola king, on hearing of the Muni’s appreciation, paid a visit to the shrine and meeting Nāthamuni inquired the reason of his appreciation of the unfamiliar tune. It is said that Nāthamuni directed a number of bronze cymbals of different weights to be sounded together and forthwith described correctly their different weights from a perception of the acute differences in the pitches of the notes. The king, admiring his peculiar powers, was satisfied of the superiority of the celestial tune to which the Tamil songs had been set. but we may take it that, the site of the city was even then an alternative capital of the Cholas with Uṛaiyur, near Trichinopoly, which was no doubt the metropolis of the dominions. Contact with the Chola ruler is frequently mentioned both in the life of Nāthamuni and of his grandson Yamunacharya and it is clear that the reference is to the Chola ruler when he went into residence at the secondary capital above referred to though no doubt both the sages spent a large portion of their later lives at Śrīraṅgam which was near the permanent capital Uṛaiyur. More correctly speaking Uṛaiyur had ceased to be the capital by this time. Tanjore (Thanjavur) had not yet become the capital of the Cholas. Another story in the life of Nāthamuni connects him with the Tamil poet Kamban, the author of the Tamil Rāmāyaṇa. It is said that this future Poet - laureate of various kings composed his grand poem at the residence of his first patron Caṭakōpaṉ Mudaliar at Tiruvannainallur, generally assumed to be the place of that name in the South Arcot District, and went about the country reading out portions of his work and soliciting favourable opinions of scholars. On reaching Śrīraṅgam he had to face an assembly of Pandits presided over by Nāthamuni. It would seem that the latter was at first not appreciative but was finally won over by the intrinsic merit of the production. It is also supposed that an existing poem of over 100 stanzas on Caṭakōpaṉ is by Kamban and was composed to honour the Vaishnava Āḻvār. This story may appear to be the invention of Tamil scholars of the Vaishnava persuasion to bring the eminent Kamban into the fold of the admirers of Caṭakōpaṉ and Nāthamuni and is incompatible with the general opinion that Kamban was the court-poet of Kulottunga l who reigned from 1070 A.D. But there is a tradition embodied in an ancient Tamil verse that Kamban composed his Rāmāyaṇa in the Saka year 807, corresponding to A.D. 885. If this is to be relied upon as accurate, there is no inherent improbability in the story of young Kamban meeting the sage Nāthamuni who must have been then well advanced in years. In accordance with the custom of the times, Nāthamuni went on a tour to Northern India, visiting the scenes of Krishna’s birth at Muttra and the neighbouring places. His travels extended to the distant Bādari or Badrināth on the north, Dwārkā, Krishna’s capital in Kathiawar on the west and Jagannāth on the eastern coast. Nāthamuni’s travel was apparently for pilgrimage and not for religious preaching, as was that of Śaṅkara before him or of Rāmānuja afterwards. It was in commemoration of this visit, with his son and daughter-in-law, to the banks of the Yamuna or Jumna that his grandson, born about 916 A.D., is said to have been named Yamuna. Nāthamuni returned to the south in due course via Jagannāth and is said to have lived a few years only after the birth of his grandson. The story of Nāthamuni’s death is worthy of the ardent devotee that he is reputed to have been. One day a party of huntsmen headed by the Chola king rode past the residence of Nāthamuni at Viranarayanapura. The sage, interrupted in his meditations by the attendant bustle, opened his eyes and, thinking the party to be the divine Rāma and his brother, on whom, we may suppose, his thoughts were wholly bent in meditation, followed the track of the party and walked with weary steps till the very gates of the Chola capital Gangaikondapuram, and there dropped down dead through sheer fatigue. His son Īśvaramuni, the father of the famous Yamunacharya, duly discovered his whereabouts and did the funeral obsequies which the remains of the illustrious man demanded. The duration of Nāthamuni’s life must be left undetermined, as we cannot accept as reliable the traditional accounts which assign a period of from 350 to 500 years for the sage. We must, for the present, be satisfied with supposing that the sage was born somewhere in the firsts quarter of the 9th century and that he lived just over a hundred years, an age exceeded by Rāmānuja himself, by Vidyaranya, and by his contemporary, Vedanta Deśika, if the traditions that can be proved to have been current from the fifteenth century downwards be accepted as true.